Please note that the above times indicate the serving time and the total duration of the provided service. However our Chef(s) will arrive at the selected location 120 minutes prior to the serving time in order to do all the necessary preparations. Please note that children are considered the individuals of 15 years old or younger. Please select your 9 course meal. You may choose only one Main Course, however you are free to design your remaining options. Please select your 12 course meal. You may choose only one Main Course, however you are free to design your remaining options. Please select your 6 course meal. You may choose only one Main Course, however you are free to design your remaining options. Please select your 8 course meal. You may choose only one Main Course, however you are free to design your remaining options. 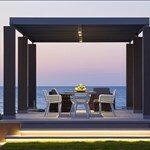 To arrange for a Private Chef evening during your villa holiday in Crete is no longer limited to the very few. It is in fact becoming a popular trend with families and groups wishing to enjoy the restaurant feeling in their very own private villa, yacht or holiday apartment. Alargo is delighted to team up with the renowned Private Chef duo; Christos & Stella. Stella (chef and wine specialist) and Christos (executive chef), our partnered Private Chefs will prepare and cook meals for guests who are interested in taking part and enjoying the renowned Greek cuisine and gastronomy. The team is known for their exciting combinations, creating traditional dishes based on Cretan ingredients with the use of international techniques and interpretations. Their cooking is both innovative, exclusive and modern - yet it manages to compromise the traditional elements and flavors of the Cretan cusine. Their fine restaurant dining is presented to our guests in the comfort of their very own villas, at wedding receptions and that of exclusive private yacht dining. With their extensive knowledge of private VIP dining, our guests can rest assured that they will enjoy culinary moments worth remembering. Christos & Stella are professionally trained chefs with many years of experience in Greece and abroad. They are the formerly owners of the Emerald Restaurant and has since 2009 provided a flying private chef service together with their team, offering private chef services in Crete and overseas. The demand for their services abroad has made it possible for the team to take onboard the global food trends, whilst ensuring the traditions of Cretan cusine is offered beyond the boarder of Greece. Christos graduated from the Culinary School of Heraklion, to continue his 4 year training at NOBU restaurants in Athens and St Moritz. He later returned to Greece to work alongside the famous chef Christoforos Peskias as his pastry chef in P Box. He makes sure to attend yearly seminars from Alain Ducasse and Emmanuel Hammon to ensure his skills are kept up to date. Stella obtained the advanced diploma of WSET Wine and Spirits Educational Trust and has passed the introductory course from the Court of Master Sommeliers. Their combination of experience and education has proven to be a success, having managed to pull of demanding events with excellence and with references available upon request. Our service is flexible as well as delicious, and you can choose as many servings as you like when you hire our private chefs in Crete. Book a sumptuous one-off dinner from our carefully selected set menus, or let our chefs cook your favourite meals for part or all of your villa or yacht holiday in Crete. Stella and Christos will make it easy to host an amazing, memorable event at your party venue, yacht or holiday home. 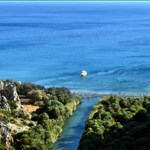 Our chefs' service is offered up to 40km from Kokkino Chorio in the Apokoronas region. For an additional fee, they can travel to any location on the island of Crete (Please contact us for further information). From start to finish, Stella and Christos will take care of all your needs: they'll supply all the fresh ingredients, prepare, cook and serve the food, and then clean up afterwards. Meanwhile, you can sit back, perhaps enjoy a glass of wine or two, and savour the gastronomic experience that awaits you. Christos & Stella, together with all of our partnered chefs follow strict food and sanitation rules and consider dietary restrictions, whilst always ensuring local fresh produce and ingredients are used. The meals are all prepared in the guests’ villa or selected venue, and maybe one of the most enjoyable part is that our private chefs will ensure they leave the guest’s kitchen clean and sanitized after use, and no washing up to do at the end of the night for the host. To give you a taste of what's on offer, take a look through our delicious preset menus here, and we can arrange special events from canapé receptions to cookery classes, and anything else you'd like to arrange. Book Stella and Christos as your private chef for part or all of your holiday in Crete, and let us elevate meal times from a worry to sumptuous occasions to enjoy, savour and remember. 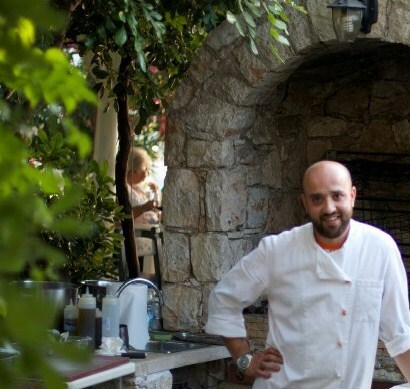 Alargo is pleased to be offering both Private Chef and Wedding menus from Christos and Stella. Feel free to browse through the selected menus for further inspiration. Flowers and decorations for venue and tables, based upon the wishes from our guests. Alcoholic and non-alcoholic drinks, based on guests’ requirements and taste. The wedding menu prices are based on receptions within 30kms from the base of the team and with max guest capacity of 60. An additional cost may apply for services held further afield. Please contact us for a quotation based on your location. Private Chef services with online booking, payment by debit or credit card and confirmation. Seasonal four course pre-set dinner menus to choose from with service for up to 12 guests. Prices shown on the preset menus correspond to a maximum number of 12 guests. Christos & Stella cater for larger groups and the prices are adjusted accordingly. If your group consists from more than 12 guests, please contact us for a quotation. The option to hire our Chefs for a day, night or longer periods on a service basis only and design your own menus from scratch together with our Chefs. Wine pairing for selected menus and assistance in delivery from local vendors. Wine tastings accompanied with our set menus or cold finger food assortments. All menu planning and consulting, on-site preparation, and full kitchen clean-up. Prices for the are preset menus are per person and include the cost of food. Our partners are stocked with all kitchen appliances and utensils, place settings and glassware if necessary. Menus can be adjusted with additional consulting to accommodate for dietary restrictions, preferences and/or allergies. Private dining in special locations like vineyards or olive groves is available upon request at extra charge. Please contact us for details. Wine tour to a local Winery and tasting. Food tour in the old city of Chania. Greek cuisine is the mother of all Mediterranean diets and the source of their envied reputations around the world for flavour and health. Greek food is supremely rich, delicious and has always been nutritious. 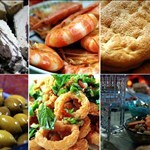 The nutritional habits and traditions of Crete gave rise to the term "Mediterranean Diet" in the 1960s, and its dietary model put Greece on the culinary map. The vitality and longevity of the population there was ample evidence for scientists the world over to investigate the so-called ‘Cretan phenomenon’. Their findings back up the promotion of the Mediterranean diet as one that provides the body with all the nutrition it needs for long-lasting health and wellbeing. Research data suggests that adopting the pyramid of nutritional guidelines depicted in the Greek - Mediterranean diet directly reduces risk of diseases linked to poor nutrition, such as obesity, type-B diabetes and cardiovascular disorders. Greek cuisine is a marriage of health with luscious indulgence and its cornerstones are the integrity of the ingredients and seasonality. Among the ingredients that make Greek food so mouthwatering and nutritious at the same time are excellent quality olive oil (with 80% of Greek olive oil extra virgin by nature), abundant sun-kissed fruit and vegetables, and the finest honey and yogurt in the world. Herbs, greens, whole grains and other wild foods provide distinctly Greek accents and flavours. Delicious, expertly prepared and cut meats and cheeses complete the philosophy. Stella and Christos, through their innovative cooking, have taken this philosophy and raised Cretan cooking to new levels. Their evolution of traditional Cretan cuisine is equivalent to what the finest Greek restaurants are creating, brought to you and your guests at your villa holidays in Crete, the reception of your wedding, celebrations on a yacht or at any suitable venue on the island of Crete. Petimezi: Dark, syrupy reduced grape must. Tomatada: Tomato sauce from fresh tomatoes. Dolmadakia: vine leaves stuffed with herbal rice. Apaki: Lean pork, salted and (optionally) smoked. Cretan herbs: fresh oregano, thyme, rosemary and more. Mizithra: Fresh cheese made with sheep or goats' milk and whey. Stifado: Stew flavoured with pearl onions, vinegar, red wine and cinnamon. Gemista: A family of stuffed vegetable dishes: stuffed peppers, grape leaves, tomatoes, etc. Gavros: the European anchovy (Engraulis encrasicolus), a delicious forage fish and relation of the herring. Baklava: Rich, sweetened pastry made with layers of filo and chopped nuts, and held together with syrup. Tirokafteri: a spicy spread with a cheese base which may vary from region to region (most commonly include feta cheese) and hot peppers. Boureki: A traditional pie baked with or without a thick filo top crust. It is filled with sliced zucchini, potato, mizithra or feta cheese, and spearmint. Yahni: a stew which can be prepared based on a variety of its main ingredient (fish, meat, vegetables) cooked slowly over a low heat, spiced and seasoned. Kalamon or Kalamata Olives: A superior variety of edible olives produced in Greece and specifically in the regions of Messinia (Kalamata) and Lakonia (Sparta). Tsakistes: Olives that are gently crushed by hand (without crushing the seed) usually by using a stone, preserved and matured in light brine and lemon juice with a hint of olive oil. Tsigariasta Vlita: Sautéed green amaranth (amaranthus blitum, native to the Mediterranean region). Pronounced as ‘vleeta’, a delicacy, most commonly boiled, then served with olive oil and lemon juice like a salad, sometimes alongside fried fish. Skordalia: Α thick puree (or sauce, dip, spread, etc.) made by combining crushed garlic with a bulky base (purée of potatoes, walnuts, almonds, or liquid-soaked stale bread) and then beating in olive oil and optionally vinegar to make a smooth emulsion. Hochlee boubouristi: Fried wild snails with coarse salt, rosemary and vinegar. Perhaps the most well-known, at least within Greece, traditional Cretan recipe and admittedly a very difficult name to be pronounced by the non-Greeks. While in other parts of Greece, snails are called ‘saligaria’, in the dialect of Crete where elements of the ancient Greek language are still present in every day’s vocabulary, snails are called (pronounced) ‘hochlee’. The word is derived from the ancient Greek word “cochlea” meaning spiral and used to describe a snail-shell like structure. ‘Boubouristi’, the second word of this traditional recipe is derived from "abouboura" another Cretan word which means ‘prone’, lying flat, face down.